Over the past few decades, Dr. Temple Grandin has become a respected speaker, author, and prominent advocate for autistic populations. Diagnosed with autism at the age of two and nonverbal until she was four years old, Grandin’s childhood was enriched by one-on-one speech therapy and the extra assistance of a caregiver. With a degree in psychology from Franklin Pierce College, a master’s in animal science from Arizona State University, and a doctoral degree in animal science from the University of Illinois at Urbana-Champaign, Grandin is also a well-respected professor of animal science at Colorado State University and works as a consultant on both livestock handling equipment and animal welfare. 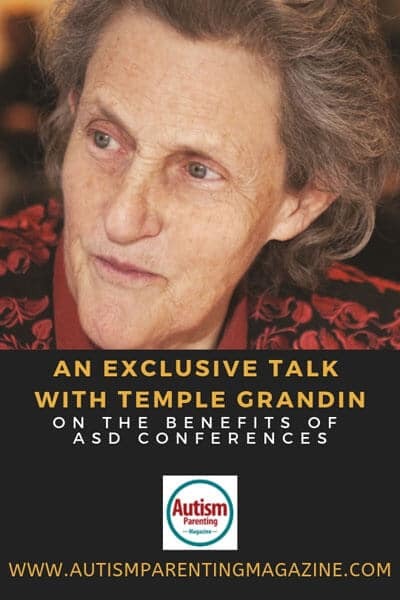 She currently speaks at autism conferences all over the US sharing her personal and professional guidance.Take a look at an exclusive interview with Grandin as she shares some of the topics she plans to discuss at an upcoming conference in March. APM: The Converge Autism Summit hosted by Springbrook Autism Behavioral Health is coming up next month. One of the learning objectives listed for your keynote address is a focus on the importance of building on an individual with autism’s areas of strength and interest in order to provide effective services. How will you address that in your Converge keynote address? Grandin: One of the things I’m seeing now is kids who are getting addicted to video games and they’re not having good outcomes. We need to get them outside, doing things with animals and doing and limiting the screen times to about an hour a day. Some of these kids who are ADHD and autistic – especially on the mild end of the spectrum – they’d be very good at working with cattle, working with dogs, working with horses and working with many different types of animals. We’ve got to, with some of these kids, limit screen time to one hour a day. We need to get kids out doing a lot of hands-on things. I think it’s bad that schools have taken out art, auto shop, and theater. Kids have to get exposed to different career options to even figure out what they might want to do. APM: Over the years, have you seen a shift in thinking or attitude at autism events/conferences as more people become more aware/educated —perhaps a broadened understanding and reassurance? Grandin: We’re getting too locked into the label. It’s such a broad spectrum. Since we changed the guidelines [of defining the autism scale], we have this quagmire of a spectrum. Some will need supervised living situations for the rest of their lives. That’s just the way it is. But I’m seeing too many smart, fully verbal kids playing too many video games. I see kids that graduate from high school, and they’ve never had jobs. They never learn to work. Sudden transitions are disasters [for individuals on the spectrum]. They need to learn how to do things outside of the family at a young age – volunteer jobs, even a job where they walk dogs for the neighbors. They need something they are responsible for every single day – get a job and learn how to work. They need to learn initiative and be exposed to different activities and skills to see if there is something they like to do. They also get friends from a shared interest. They need to have something interesting to do. For children with more severe forms of autism, they need more specialized service. They still need to have interesting things to do. They need to learn everything they can learn. If they are non-verbal, introduce a tablet with a text messaging program. See if they can learn how to type on it. Phones are too little. Use a tablet where the print appears next to the keyboard. That’s important. We look the same when we’re little, and then when we get older, we need different services. We need good early intervention. APM: What are the benefits to both families and industry professionals attending autism conferences? Grandin: Learn from other parents who are in the same boat. You learn there are other people dealing with the same problems you face. You can talk to other parents about what other services are available. APM: There is so much to be learned at an autism conference, would you say it’s also an excellent opportunity for autism families to meet and connect with other people? Grandin: It’s important to go to conferences. I tell every [ASD] family I meet to do two things: go to conferences and find a local support group. APM: Other than speaking at conferences, what are you currently working on to broaden views in the autism community? Grandin: In my book, The Autistic Brain, I talk about different types of thinking. Some people are visual thinkers and can’t do algebra; other are more mathematical and pattern-minded. Those are usually your engineers and programmers. Autism varies from Silicon Valley to Einstein to Mozart to someone who is just geeky and socially awkward to someone who can’t dress themselves. And they’re becoming too much the label. I’m seeing too many kids who aren’t learning basic skills like shopping. They need to get paper routes outside the home or walk dogs for the neighbors when they’re in middle school. These kids have to learn how to work, and they need to learn how to work way before they graduate from high school. APM: You are an inspiration and role model to hundreds of thousands of families and persons with autism. What inspires you? Grandin: The feedback I get from conferences. I get letters from parents who attended a conference where I spoke five or ten years ago, and they tell me their son or daughter went to college because of my book or something I said at the conference. I love hearing the stories of kids who have grown up and have jobs and families and are doing just great. I love those letters. I have some of them on my wall. Dr. Grandin will be the keynote speaker at the 3rd Annual Converge Autism Summit hosted by Springbrook Autism Behavioral Health, March 7-8, 2019, at the Greenville Convention Center in Greenville, S.C. The Converge Autism Summit is geared towards industry professionals but is also open to parents and caregivers from around the nation as a chance to meet and discuss educational, therapeutic, social and psychological topics related to autism spectrum disorder. To register or for more information, please visit convergeautism.com.